Vishnu is a form of the Supreme Person, described in the Srimad-Bhagavatam as an extraordinarily beautiful male with a dark bluish complexion, decorated with dazzling, spiritual gems, and four hands—holding a club, conchshell, chakra (disc), and lotus flower. In the Bhagavad-gita, Krishna explains that the ultimate goal of the mystic yoga system is to fix one's mind on the form of Vishnu within the heart. By doing so, one can transfer himself to the spiritual world, which is beyond all the material universes. A unique form of Vishnu presides over each planet there and is eternally served with great reverence and affection by countless devotees. 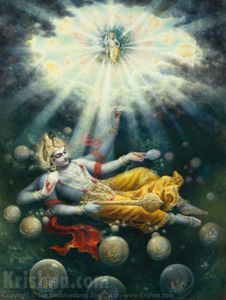 The painting depicts Krishna (top right) expanding Himself into Vishnu forms in the course of manifesting the material universes. - Quotations describing how the universe is created and destroyed. Who's First, Vishnu or Krishna? - A discussion of the relative positions of the creator and the playful, ever-youthful cowherd boy of Vrindavan. - since Vishnu is within everyone's heart, devotees of the Supreme Lord treat their bodies as sacred spaces. "A yogi who is practicing meditation on the Supersoul sees within himself the plenary portion of Krishna as Vishnu—with four hands, holding conchshell, wheel, club and lotus flower. The yogi should know that Vishnu is not different from Krishna. Krishna in this form of Supersoul is situated in everyone's heart." "For material creation, Lord Krishna's plenary expansion assumes three Vishnus. The first one, Maha-Vishnu, creates the total material energy, known as the mahat-tattva. The second, Garbhodakashayi Vishnu, enters into all the universes to create diversities in each of them. The third, Ksirodakashayi Vishnu, is diffused as the all-pervading Supersoul in all the universes and is known as Paramatma. He is present even within the atoms. Anyone who knows these three Vishnus can be liberated from material entanglement." ". . .in the brahma-jyotir (spiritual sky) there are innumerable spiritual planets. The number of these planets is far, far greater than all of the planets of this material world. This material world has been approximated as only one quarter of the creation (ekamsena sthito jagat). In this material segment there are millions and billions of universes with trillions of planets and suns, stars and moons. But this whole material creation is only a fragment of the total creation. Most of the creation is in the spiritual sky." "The Maha-Vishnu, or Karanodakashayi Vishnu, is described in the Brahma-samhita (Brahma-samhita, 5.47). Yan karanarnava-jale bhajati sma yoga-nidram: the Supreme Lord, Krishna, the cause of all causes, lies down in the cosmic ocean as Maha-Vishnu. Therefore the Supreme Personality of Godhead is the beginning of this universe, the maintainer of the universal manifestations, and the end of all energy." "Also it is said in Vedic literature that one Vishnu is present everywhere by His omnipotence, just as the sun appears in many places to many persons." "The impersonalists are supposed to be situated in the mode of goodness, and they worship five kinds of demigods. They worship the impersonal Vishnu form in the material world, which is known as philosophized Vishnu. Vishnu is the expansion of the Supreme Personality of Godhead, but the impersonalists, because they do not ultimately believe in the Supreme Personality of Godhead, imagine that the Vishnu form is just another aspect of the impersonal Brahman . . . "
"… the pure transcendentalists worship the form of goodness, Vishnu, in His various forms. Vishnu is manifested by His millions and billions of integrated forms and separated forms. The integrated forms are called Godhead, and the separated forms are called the living entities or the jivas. Both the jivas and Godhead have their original spiritual forms. Jivas are sometimes subjected to the control of material energy, but the Vishnu forms are always controllers of this energy. When Vishnu, the Personality of Godhead, appears in the material world, He comes to deliver the conditioned living beings who are under the material energy." Is following Krishna the same as following Vishnu, since Vishnu is Krishna’s avatar?